Therm-a-Rest LuxuryLite Mesh Cot. Extremely compact and lightweight, our mesh cot features breathable fabric that allows for excellent ventilation. The ideal solution for off-the-ground sleeping comfort in warm weather, the updated LuxuryLite® Mesh Cot is easier to set up than ever. The new deluxe carry case allows you to keep cot feet and bows assembled resulting in fewer pieces for lightning fast set up. Offered in an expanded range of sizes, this ultra-compact outdoor cot is a great choice for camping comfort in arid high country or motorcycle touring in warm weather. Cot includes a deluxe carry bag. BowFrame™ Technology: Cot's patented BowFrame design eliminates painful crossbars and squeaky joints. Light & Packable: Extremely light, compact design fits easily in a pannier, portage bag or backpack. Easy Set Up: Shock-corded poles and pre-assembled feet make set-up and break-down a snap. Cool Fabric: Breathable mesh allows excellent ventilation in hot weather. 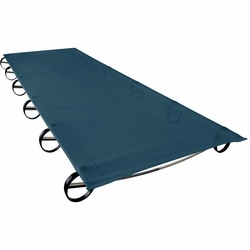 Durable Construction: Fabric is stretch-free, anodized aluminum poles and durable nylon feet stand up to heavy use.